Never denigrating or stereotyping, Lewis is a talented storyteller, offering an affectionate portrait of life in the Missouri Ozarks. 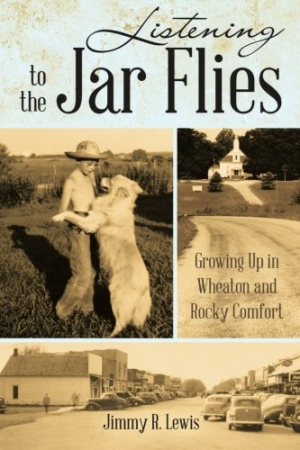 Listening to the Jar Flies: Growing Up in Wheaton and Rocky Comfort is an affectionate look at twentieth-century residents and events in two small Missouri Ozark towns. Jimmy R. Lewis neatly reaches as far back as 1907 for stories about his family and other “very practical, often comical, but extremely wise people” that populate this southwestern corner of the state. Lewis is a talented storyteller. Reading these accounts is like being at a family reunion, hearing lively tales—preferably told outdoors in late summer, with the titular jar flies, or cicadas, buzzing in the trees—about the feats and foibles of folks you dimly remember as neighbors, ancestors, or teachers. Lewis dishes up a generous dose of nostalgia for those baby boomers who grew up in small-town America, and who will perhaps not-so-fondly remember how they couldn’t get away with any youthful wild behavior thanks to a network of surrogate parents ratting them out before they even returned home. Gentle humor is a seasoning that Lewis liberally applies. There are heaping helpings of stories about local eccentrics, including official “Town Loafer” Ephron Decker and his impressive dedication to the art of avoiding manual labor; the antics of sparring grocers during the Great Banana War; and several pages about hermit bachelor Palo Stewart, his unique sartorial style, and his habit of wearing dentures only while eating (after Palo had dined, he would pop his false teeth out, lick them clean, and deposit them back into his shirt pocket). These are not corny portraits of rubes; rather, they are unvarnished descriptions of some very original, very independent-minded folks, and Lewis takes care not to denigrate or stereotype. The many photographs in the book are a great help in keeping track of this large cast of characters. While much of the book has a folksy, humorous tone, there are also serious chapters describing the lean years of the Great Depression and specific tragedies that occurred in these rural towns; these sections are recounted in more journalistic fashion. It is enlightening to read about the community gardens and relief canning factories that kept town residents fed and employed during the 1930s. Lewis offers several chapters about hometown heroes, like the doctors who provided medical care to families that couldn’t pay for it, railroad workers and organizers beaten up or killed during labor disputes, and local merchants who took care of customers in many ways that didn’t fill up their cash registers. Readers who are familiar with this part of Missouri and its tough hill-country folks will savor this book the most, but even if one’s background is far removed from the Ozarks, this book has so much interesting material that it will appeal to anyone who enjoys regional history, homespun tales about small town life, or a very rich biography.